By Bruce Nichols. McFarland & Company, Inc.
Bruce Nichols is an analyst in the Department of Defense and currently lives in St. Louis. He wanted to produce an in-depth account of all guerrilla operations in Missouri and has created four paperbound volumes due to the amount of material available: Volume I, 1862 (2004, 256pp., 978-0-7864-6927-7); Volume II, 1863 (2007, 389pp., 978-0-7864-6928-4) (illustrated above); Volume III, January-August 1864 (2014, 479pp., 978-0-7864-3813-6); and Volume IV, September 1864-June 1865 (2014, 453pp., 978-0-7864-7854-1). With the thousands of volumes published on the American Civil War and even down to the subject level of these books, one is prompted to ask “Is there any more than can be written on the topic?” The simple and obvious answer is “Yes, of course”. It would take, however, somebody with a memory of multi-computer capabilities to work out what was new in these four recent volumes; a task, unfortunately, far beyond this reviewer. But, with over 1,500 pages, there will be something new here for every reader. Each volume divides Missouri into four quadrants: northwest, northeast, southeast and southwest, and within these the year is split into the four seasons, except of course Volumes III and IV where complete years are not covered. This enables the reader to see the relationship of seemingly isolated events to other events in a given area over a period of time. 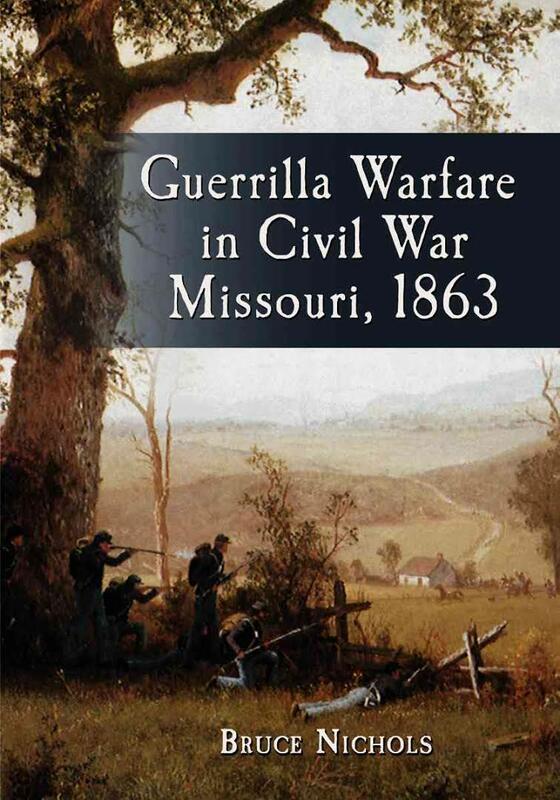 Additional chapters are included, covering specific topics, such as in Volume I, “Operating Deep Behind Enemy Lines”, ”Policy Evolves (March through May 1862)”, and “The Enrolled Missouri Militia: Guerrillas’ Controversial New Enemy”. As one might expect from such publications, there are notes, a bibliography, an index and numerous illustrations: both maps and photographs. The bibliographies consist of Manuscripts, Missouri Civil War newspapers, Missouri Post-Civil War newspapers, periodical articles, U.S. Government Publications, Missouri Government Publications, Military Unit Histories and Memoirs, County and local Histories, and books. Those interested in the Missouri guerrillas will have heard of, or may have in their collections, some of the source books (in Vol. I, the thinnest): Bartels, Castel, Connelley, Eakin and Hale, Edwards, Fellman, Monaghan and Shoemaker to name but a few. Others will possibly be new to some people. Anybody interested in Missouri guerrillas should have these four volumes on their book shelves. They are highly recommended and well-worth buying.